Challenging students to "Be a voice, not an echo", Prof. Dr Willem Jonker, CEO of EIT Digital, congratulated more than 200 new graduates from the EIT Digital Master School on their entry into the world of digital transformation during the official Master School Ceremony in Madrid. These Master School graduates are now part of a growing community of alumni educated to strengthen Europe's position in the digital economy. Cohort 2015-2017 is the fourth to graduate from EIT Digital's Master School programme, which was celebrated at a graduation event hosted by the University of Madrid, an EIT Digital partner. 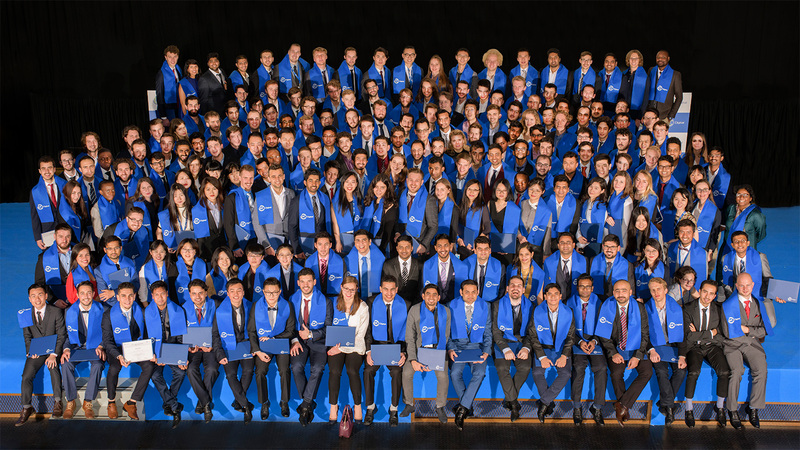 Before the official ceremony, where graduates received their diploma from the Head of the EIT Digital Master School Dr Patrick Hartigan, and a graduation scarf from Prof. Jonker, EIT Digital partners also welcomed the students into the world of digital transformation. David del Val, President of Telefónica R&D in Madrid congratulated the graduates and highlighted that this Master School education comes with a responsibility; "This graduation is just the beginning of the responsibilities of the rest of your life. The future of society is built on what your generation is going to build. You must ask yourself: how are you going to improve society?" Silviano Andreu, Head of Minsait by Indra, also spoke about the digital transformation the graduates will encounter. "We are going from a buying economy to a sharing economy. A set of new technologies is creating disruption in the way we think and operate in business today. The future is yours!" In this world of digital change, and in the words of Albert Einstein, it is important to "Be a voice, not an echo". That is exactly what Jonker expects from the newly graduated students; "We expect you to develop the digital technology that today nobody heard of, or thought about." Prof. Jonker continued as he expressed the need for Europe to have businesses leading the digital economy; "The digital economy has no boundaries. We should avoid using digital technology for the wrong things and creating monopolies. Technology is not free of values. Europe must therefore be present in that world." Every year more international students get their double master degree for studying at two different European top universities and a certificate from the European Institute of Innovation and Technology (EIT). This year 204 students graduated compared to 138 in 2016. A recent study amongst our former graduates shows that 76 per cent of graduates find a job after graduation. Of this number, 28 per cent already had a job prior to their graduation. Twelve per cent of EIT Digital Master School graduates have continued their studies with a PhD and almost ten per cent of former students have started their own firm. Of all questioned alumni, almost 65 per cent are working on or planning to found their own company within the next two years. Eight Master School programmes are taught at 17 different universities in The Netherlands, Germany, Sweden, Finland, France, Italy, Spain and Hungary. The celebration is therefore not just for the students; it also marks the success of a truly European education programme that brings together people with the necessary skills to foster Europe's digital transformation.